Using sterling silver, the Karen hill tribe jewelers craft this necklace by hand. 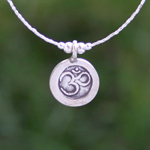 The medallion features the spiritual "Om" syllable. They hang it on a beaded chain and attach a spring clasp for closing.